Anna Pilato has extensive experience in conservative, anti-abortion politics, having worked in the administrations of Kansas Governor Sam Brownback and President George W. Bush. As director of Bush’s the Department of Health and Human Services (HHS) Center for Faith-Based and Community Initiatives, she helped develop the “conscience rule” that expanded protections for health care providers who refuse to perform services because of religious or moral objections. She’s also worked for the Fairfax, Virginia Republican Committee. Immediately before joining the Trump administration, Pilato was employed at the anti-abortion extremist organization Concerned Women for America. She began her career at far right-wing televangelist for Pat Robertson’s Christian Broadcasting Network. 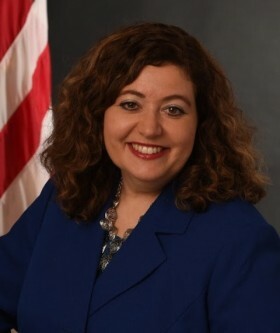 The Deputy Assistant Secretary for External Affairs oversees the Administration for Children and Families’ (ACF) Office of Communications and Office of Regional Operations. The Office of Communications is responsible for media relations and relaying information about ACF’s family planning and reproductive health programs, policies and initiatives to the public. The Office of Regional Operations oversees the ten regional ACF offices that work directly with state and local entities served and affected by the agency’s programs and policies. As the individual in charge of the Office of Communications, Anna Pilato is in a position to influence the timing, volume and accuracy of information released to the media and the public, thereby shaping perceptions and knowledge of ACF’s work. Responsible for ACF’s regional offices, Pilato is able to influence how the agency’s family planning and reproductive health programs, policies and initiatives are implemented throughout the United States. Anti-Feminist: “The feminist agenda is not about equal rights for women. It is about a socialist, anti-family political movement that encourages women to leave their husbands, kill their children, practice witchcraft, destroy capitalism and become lesbians." Pilato spent more than four years working in the Kansas Department for Children and Families while Brownback was governor of the state. As governor of Kansas, Brownback signed at least 19 pieces of anti-abortion legislation. As Brownback’s administration was ending, he wrote a letter urging President Trump and congressional leaders to use Kansas’s anti-abortion laws as a model for federal legislation: “With the new administration in Washington and both houses of Congress controlled by pro-life majorities, we must grasp the opportunity to proclaim and protect the dignity of life,” he wrote. Trump later appointed Brownback head of the Office of International Religious Freedom.